Alok Choudhary is the chair and Professor of Electrical Engineering and Computer Science Department. He is also a Professor of Marketing and Technology Industry Management at Kellogg School of Management at Northwestern University. From 1989 to 1996, he was an a faculty in the ECE department at Syracuse University. 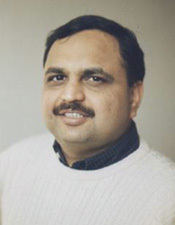 Alok Choudhary received his Ph.D. from University of Illinois, Urbana-Champaign, in Electrical and Computer Engineering, in 1989, an M.S. from University of Massachusetts, Amherst, in 1986, and B.E. (Hons.) from Birla Institue of Technology and Science, Pilani, India in 1982. Dr. Choudhary was a co-founder of Accelchip Inc. and was its Vice President for Research and Technology from 2000-2002. He received the National Science Foundation's Young Investigator Award in 1993, an IEEE Engineering Foundation award, an IBM Faculty Development award, and an Intel research council award. Choudhary has published more than 250 papers in various journals and conferences. He has also written a book and several book chapters on the above topics. Choudhary serves on the editorial boards of IEEE Transactions on Parallel and Distributed Systems, Journal of Parallel and Distributed Systems and International Journal of High Performance Computing and Networking. He has served as a consultant to many companies and as well as on their technical advisory boards. High-performance computing and communication systems, power aware systems, computer architecture, high-performance I/O systems and software and their applications in many domains including information processing (e.g., data mining, CRM, BI) and scientific computing (e.g., scientific discoveries). Furthermore, his interests lie in the design and evaluation of architectures and software systems (from system software such as runtime systems to compilers), high-performance servers, high-performance databases and input-output and software protection/security. Last update 04/02/08 by Abhishek.